The chairman of the National Sports Council (NSC) yesterday unveiled a newly instituted five-member interim body for West Coast Regional Sports Committee. The committee that is mandated to oversee the affairs of the regional body will serve for two months before going to congress. The committee will be chaired by Abdoul Karim Sey; Bakary Touray as vice chairperson and Awa Jawla, Bakary Bojang and Sunkaru Sanyang as members. 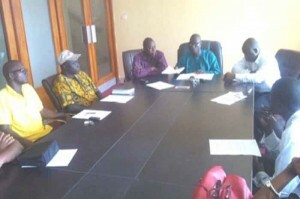 The terms of reference mandated the new committee to investigate the internal problems within the regional committee; monitor the operations and activities of the Brikama Youth and Sports Association (BYSA) Normalisation Committee with a view to resolve the lingering impasse; organise an elective congress to elect executive members for the regional sports committee within two months and any other matter that the Council may assign them. The chairman of the Council, Lamin King Colley quoted the NSC Act which was enacted on the 14th December 2000 on section 16 (2) which states that; the Divisional Sports Committee shall be under the control, supervision and direction of the Council. “The regional sports committee failed the task that they were given to do; members were divided within themselves and another group came up to counter the decision that was made by one of the executive [members] in their region; the president and some members,” he said. He further quoted the Council’s act which says that all the Divisional Sports Committees shall carry out other functions as delegated to them by the Council. He defended their decision, which he said is dictated by the act, adding that based on powers vested on them, it was deemed necessary to dissolve the committee because “we can’t work with the association and we set up a committee that will monitor and regularize them.” King Colley vowed to defend the acts of the constitution without fear or favour. Ebou Secka, the programme manager for National Sports Associations at the NSC said it was necessary for the Council to set an example if they are to deter future occurrences of leadership impasses within national associations. He said the Committee failed to cooperate as a team and work according to the mandate imposed to them by the National Sports Council Act. Abdoul Karim Sey promised that his committee would do everything they could to help to regularise sports in the region. He thanked the Council for the trust and confidence they have in them to look into the problems happening in the region. He swore to work without fear or favour.